Quercus is a large genus of woody plants from the Northern Hemisphere, including up to 400 species of what are commonly known as ‘oaks’. In North America the oaks fall almost exclusively into one of two groups, the red oak group with bristles at the lobe tips and acorns maturing over two years; and the white oak group, with lobe tips lacking bristles and acorns maturing in one year. 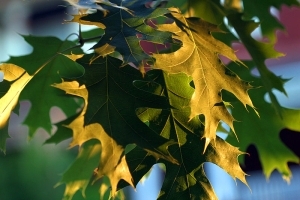 Oaks can be evergreen or deciduous. The evergreens come from warm and arid regions and their leaves are thick and leathery as an adaptation for drought. Most of the evergreen species also have prickles which are a defense against herbivory, and are especially important for evergreens because their leaves are that much more conspicuous to herbivores when other plants have lost all their foliage. Almost all oaks are trees, but in drier areas with shallow or poor soil, shrub oaks emerge from the rich gene pool that is Quercus. Aridity and poor soils tend to coax adaptation and expression, which can lead to isolation---three keys to speciation. The word “oak” will intrigue any etymologist because it is cognate in most languages of northern Europe going back to the recorded beginnings of those languages, but there is no common Indo-European root word for ‘oak’, suggesting the word itself developed in northern Europe, probably in response to the abundance of oaks there. Examples of roots are ‘ac’ in Old English; ‘ek’ in Middle Low German; and ‘eik’ in Dutch and Old Norwegian. Etymology also links a few seemingly unrelated words: oak and acorn, acre, corn, cornel, kernel, etc. Britton and Brown (1970) suggest that the name Quercus is of Celtic origin and conveys the meaning “beautiful tree”. I have not found other explanations of the name ‘Quercus’. Botanists and naturalists often point out that oaks hybridize promiscuously. Within their respective groups (red and white), the oaks frequently spawn cryptic offspring with leaves not fitting neatly into a known species, and in many cases, with leaves representative of more than one species found on the same tree. Confused, frustrated, or accommodating plant people usually settle for referring hybrid oaks to a group that could safely include them. Other characters used to identify oaks are buds, bark, acorn cups or caps, and, to some degree, habitat. Oaks inhabit most terrestrial environments within their range — wetlands, prairies, grasslands, uplands, woodlands, the coastal zone, mountain forest, outcrops, and fertile bottomlands. The genus offers a classic view of species diversity over a wide range of habitat types. Consider other genera—some exhibit a similar pattern of exploiting nearly every habitat type in their range (for example Carya (hickories)) while others are faithful to a single habitat and have not evolved species to colonize those other habitats (for example Platanus (sycamore)). Oaks are easily grown from acorns (or ach cornels). Most acorns in the white oak group will sprout a radicle in the cool fall rainy period when the seed enjoys prolonged contact with soil and rich leaf litter. The radicle can grow as long as a foot in fall and early winter, but there is no shoot growth until spring. By contrast, the red oak group acorns maintain a more strict dormancy and won’t sprout radicles in fall. They require cool moist stratification over the winter period before they germinate in spring. In containers or pots, acorns quickly reach the bottom almost regardless of depth, and begin circling, which is not ideal. Roots of even the youngest oak seedlings can be pruned or pinched to promote branching and lateral growth. This kind of root management stirs debate regarding the fundamental nature of tap-rooted species. However, in nature, even most tap-rooted trees probably run into obstacles such as bedrock, other tree roots, etc., that stimulate root branching and encourage something other than a tap root. Shifting young oaks into larger pots, or planting them directly out, after a few months in a container, is wise, as the longer they live in a crowded pot the slower they grow, and the longer it takes for them to ‘release’ or resume healthy, vigorous and rapid growth after planting out. Quercus rubra, northern red oak---Stately, large upland oak sometimes straying into moist lowland soils with good drainage, but most commonly found in rich or mesic woods. Keep in mind upland doesn’t have to mean dry, but rather suggests off the valley floors and out of the bottomlands where moisture collects. Some upland woods harbor very moist soils and, consequently, moisture-loving plants. The bark of Quercus rubra is deeply furrowed or fissured with rosy highlights. Quercus velutina, black oak---Another large and stately upland oak that may be considered a little more coarse than Q. rubra, this species can grow as tall as the other upland oak species. It’s also common in woods where soil is coarse and well drained but can be found on fairly rich sites. Leaves are as variable as any of the oaks we see in the east, ranging in breadth, length, depth of lobes and even thickness. Quercus velutina is commonly suggested as a parent in hybrid oaks. Quercus coccinea, scarlet oak---This species exhibits stricter fidelity to sandy or rocky sharply drained soils than the first two. 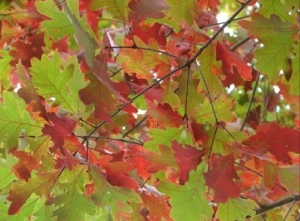 Scarlet oak is found on gorge rims, in rock, on outcrops and in areas that have burned or are fire-prone. An often distinguishing leaf character is the deeply rounded inter-lobe in the lower half of the leaf. Sometimes our understanding of a species increases when we see it in another habitat that’s scarce in our area. This oak is a good example, being abundant in the New Jersey pine barrens where sandy soils dominate. Knowing that habitat helps to understand why scarlet oak occurs where it does in our area. A good place to see scarlet oak is at South Hill. Quercus montana, chestnut oak---This prince of an oak grows in upland woods, on gorge rims, and on lake cliffs. With maturity the bark forms furrows so deep and blocky as to suggest cork oak (Quercus suber of the Mediterranean region). Chestnut oak also has long and blunt-lobed leaves similar to the swamp white oak (see below). A good place to see chestnut oak is at Thatcher’s Pinnacles. Quercus alba, white oak---One of America’s classic trees because the canopy takes a rounded form as it ages, with branches sometimes reaching the ground. The bark of white oak is flaky-shreddy in middle age but sometimes with the oldest trees, you have to look pretty high up into the canopy to find this character. Found in upland woods or more open upland woodlands. Somewhat of a generalist but Wiegand and Eames (1926) suggest it is more tolerant of clay than most oaks. Quercus bicolor, swamp white oak---A wetland oak to complement our more common upland species. Swamp white oak will grow in soils that are saturated for extended periods of time and will not be found upland, especially the higher and drier you go. Further south, in the mid-Atlantic states, there is a much greater diversity of wetland oak species--pin oak, water oak, willow oak, etc. 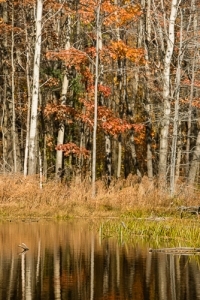 Here in the northeast and in the Finger Lakes in particular, Quercus bicolor is our main wetland species. South Hill is a good place to see swamp white oak. There are other species of oak you may see locally (Quercus muhlenbergii for example), and some of the above may be elusive at first. But even here into the late fall there are still oaks holding their russet foliage which makes them easy to spot. Britton, N.L. and A. Brown. 1970. An Illustrated Flora of The Northern United States and Canada. A republication of the 2nd revised ed. as published by Charles Scribner’s Sons in 1913 under the title An Illustrated Flora of the Northern United States, Canada, and the British Possessions. Dover Publications, New York, NY, USA. Wiegand, K. and A. Eames. 1926. The Flora of The Cayuga Lake Basin. Cornell University, Ithaca, New York, USA.